Despite some brands starting to include measurement as a key element of their mobile strategy, many are still in the dark about the performance of their mobile campaigns, apps and sites. What do I need to measure and how? are some of the questions that come up often. There’s still lack of understanding about what should be measured on mobile and how measurement can be used effectively. If used correctly mobile measurement tools offer brands the opportunity to get precise and accurate data about how customers are interacting with a mobile campaign, site or using a mobile app – precision and accuracy go hand in hand when it comes to the quality of data recorded. To obtain a high level of precision and accuracy, an important feature often overlooked by brands is the use of parameters when measuring campaigns or sites perfomance. With the use of parameters brands can record detailed and relevant information about their customers so they can see how they’re interacting with a specific campaign or to see the pages they’re navigating within a site. This enables them to segment their customer base more accurately and use this information to develop a more targeted mobile proposition. In the case of Bango, as part of our mobile analytics solution we offer over 20 campaigns parameters which brands can choose from, giving them the detailed and high quality data required to obtain accurate mobile campaign or site analytics. 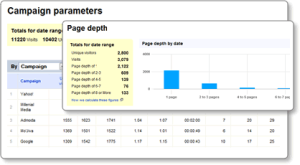 Whether brands want to measure how successful a specific banner ad campaign is or for example, if they know a visitor’s gender and would like to record this data, by passing the relevant Bango parameters: bgo_campaign or bgo_gender they can then use these metrics to segment and analyse their data more accurately. In addition brands have the option to use the Bango Analytics’s bi-dimensional reporting tool to add a second dimension when analyzing their data. Traditionally tables of analytic data are displayed by a single dimension with several columns of metrics or counts. With the new Bango bi-dimensional reporting tool – seen below, brands now get an even higher level of granularity by simply choosing a second dimension from the menu. They can compare data by country and device type for example and even compare campaign parameter by campaign parameter. So they can easily see in one report and in more detail which countries and devices are generating higher volumes of traffic or which campaign source is performing best. Below is an example of one of the reports you can see with Bango Analytics. This entry was posted in mobile analytics, Mobile apps and tagged mobile analytics, Mobile apps, mobile campaigns, mobile site. Bookmark the permalink.